You can always check Basecamp to see if there is an orange badge at the top. It indicates new things to read. However, you may not want to check Basecamp all the time to look for something new. That's why Basecamp sends notifications to tell you something happened. Click your avatar in the upper-right to open the Me menu. At the top you'll see a link to Change your notification settings. That will take you to the settings screen. Here are some details about each section of the settings screen. We bundle up notifications that happen within about 5 minutes of one another, to keep your inbox calm. Changing your email notification setting only affects notifications. It does not control other email reports that you may have enabled. Latest activity, which can be turned on or off on the Latest activity page. My assignments, which can be turned on or off on the My assignments page, reached via the My Stuff menu on your Home Screen. You can continue to turn those on and off independently. Please note that they'll remain on by default, even if you turn off email notifications altogether. Browser notifications pop up when Basecamp is open in a tab on your computer's browser. 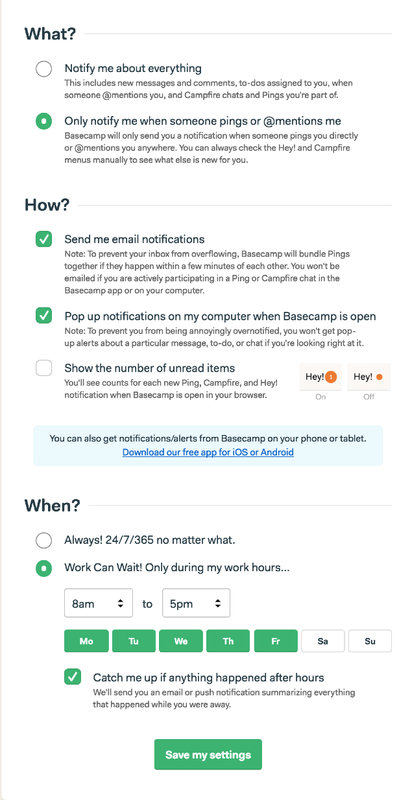 If the box is checked but you still aren't getting notifications, check your browser preferences to make sure they are allowed for Basecamp. You can also adjust your notifications settings if you’re using the Mac desktop app. Turn badges, banners, and alerts on or off through the notification settings on your computer. You can tailor the notification badges to suit your needs. If you like seeing exactly how many unread items are inside each menu, simply check this box. Prefer seeing a small dot? Leave it unchecked. 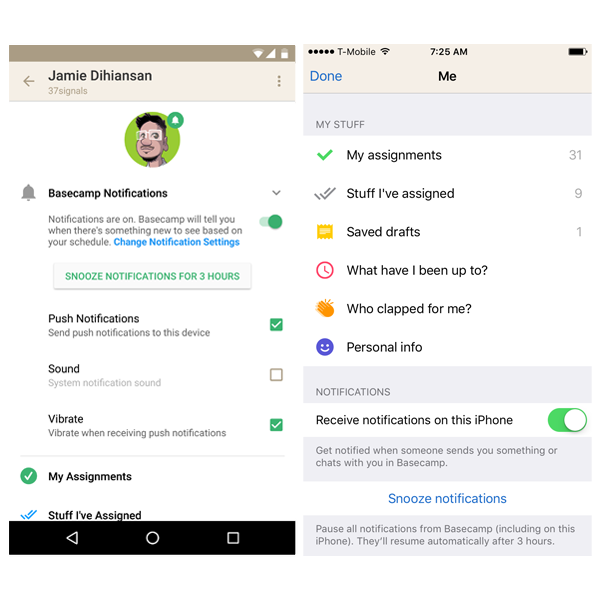 Whatever you choose, Basecamp will remember that preference on your mobile devices, too. Your devices are mentioned here after you install the Basecamp app on them. 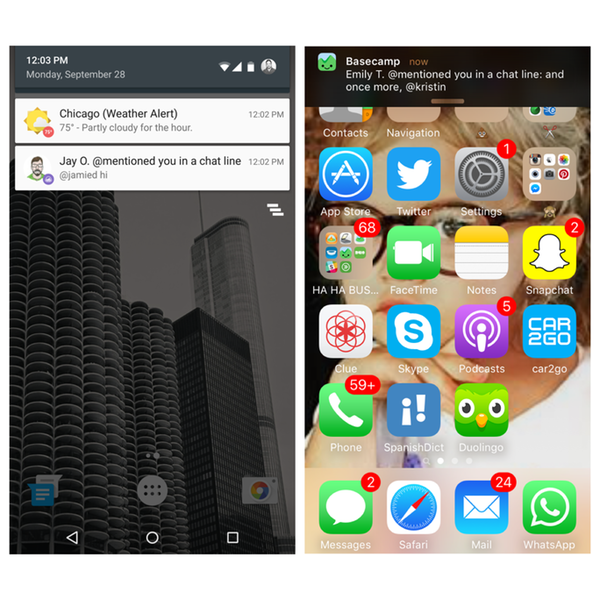 When notifications are enabled, they pop up on your phone or tablet. To turn the notifications off in the mobile app, tap on your avatar. There, you can turn on/off notifications and select to have them sent to your phone or not. Everything includes new messages, comments, Pings, to-do assignments, new events on the schedule, and automated check-ins. 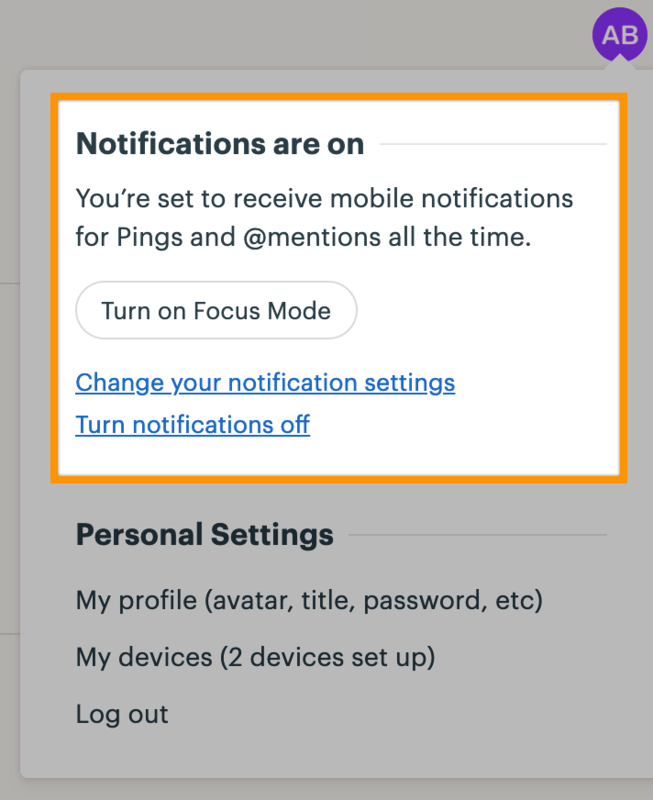 Choose Only Pings and @mentions if you prefer to check Basecamp manually for new things, but still want to be notified if somebody specifically reaches out to you. Work Can Wait prevents notifications from bothering you after hours. 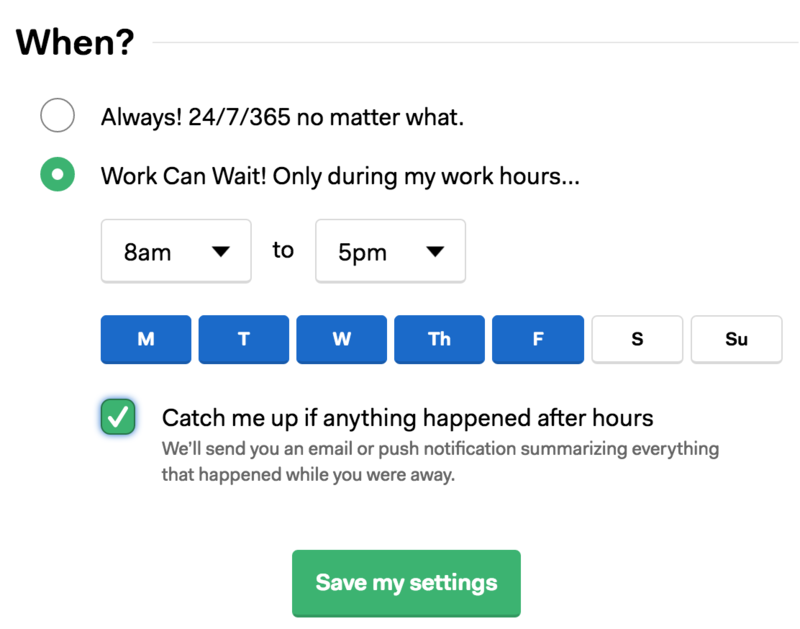 Set your hours and choose the days that Basecamp is allowed to notify you. 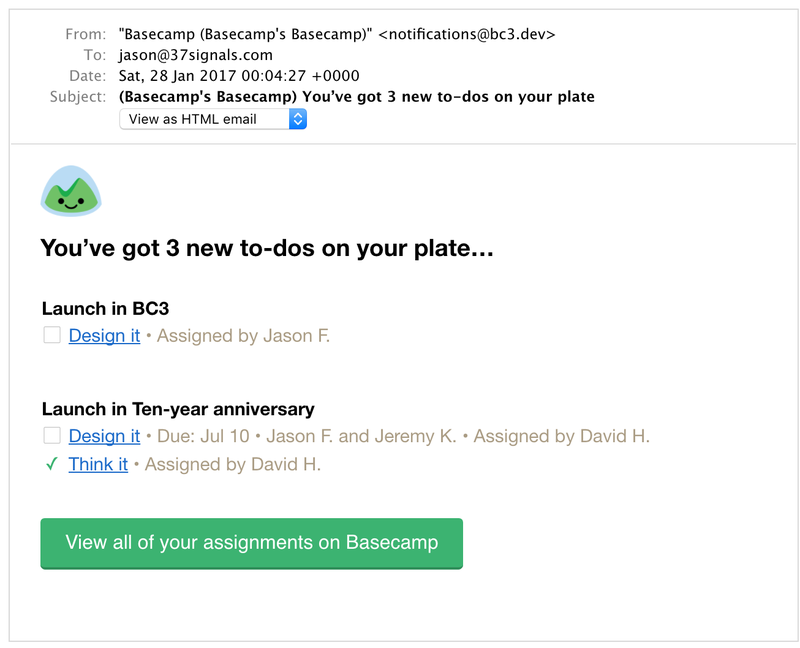 If you'd like, Basecamp will send you a catch-up email or push notification of anything you missed while you were away from work. 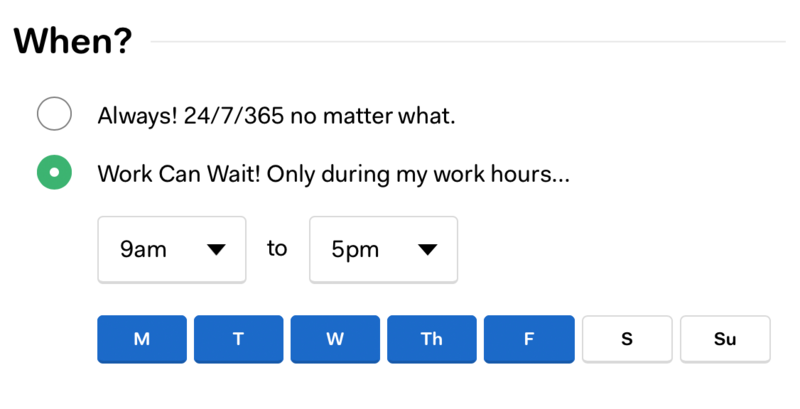 Just click the checkbox when you set your Work Can Wait hours.